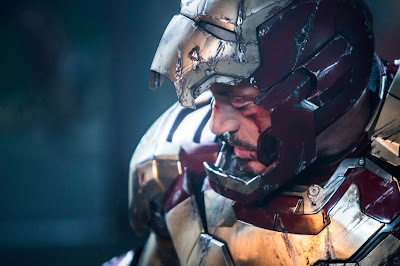 Iron Man 3 doesn't open until May 3rd (unless you live in New Zealand where it opens April 18th--damn you, you Kiwi basterds! ), but Marvel is ramping up the promotional campaign for the flick with a bevy of newposters and trailers. Two new 30-second spots were dropped today. In the trailer above we get to see more of Tony's new self-immobilizing suit in action--which seems like it would really hurt as he's basically getting pelted by heavy iron metal travelling at high velocity through the air, but hey. Plus there's also the new international trailer, which surprisingly wasn't released on National Woman's Day the other week as Gwyneth Paltrow's role is featured prominently. In it we see her don the iron suit herself, presumably foreshadowing events that eventually turns her into a super hero in her own right as Rescue. Check out Gwyneth doing her best Iron Maiden karaoke after the jump.